The Jawbone Big Jambox is an upgrade both in sound performance and features from the original Jambox. The only thing unusual about this particular speaker is that they made an ultra-compact Bluetooth speaker into something six times bigger and three times much heavier than the original model. So, is this a bright idea? According to Jawbone – it is a good idea! For starters, Big is designed to provide clear and crisp sound with detailed bass even at maximum volume. I think they were successful in this particular aspect. It’s still sleek-looking and comes in red, white and graphite color. Although it’s much heavier and weighs 2.7 pounds as opposed to 0.77 pound on the original Jambox. However, it’s still handy and you can easily pick it up and carry around thanks to its geometric design. They also equipped the speaker with 8 rubber feet which are strategically placed at the bottom. The purpose of the rubber feet is to reduce vibration and movement that is commonly caused by heavy bass. The speaker has a stainless steel construction, which means it can handle accidental bumps and falls. You can also bring it with you wherever you go it’s perfect for outdoor use. Most importantly, the Big Jambox can deliver impressive audio which can be a big bonus for outdoor parties. I also like what they did with the speaker’s software it can be updated by the user. You can set the EQ settings, BT updates, voices, etc. In short, Jawbone allows their consumer to customize their product. In addition, it can easily pair up with any Bluetooth-enabled devices, so no connectivity issue on this particular model. What Features Can I Expect From This Wireless Speaker? 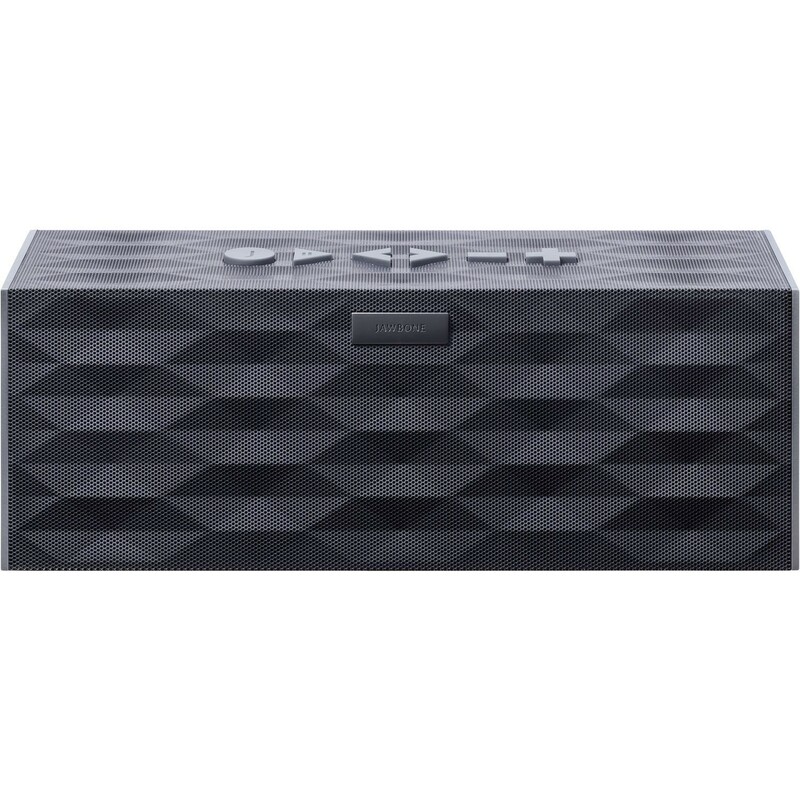 What about The Overall Design of Jawbone Big Jambox? Can It Deliver Top Quality Audio Performance? Unlike other models in the market, the Big Jambox can remember up to eight devices. It’s also possible now to pair with up to two devices simultaneously, though you will need to choose which one will be your primary device (the sound will obviously come from the primary device). A set of spongy buttons are located on top of the unit and this will include the play/pause, volume, skip tracks back and forward. There’s also a button with the letter J which tells you the amount of battery life left in the speaker. Another noteworthy feature is its omnidirectional microphone with a 360-degree sound input capability. It also features enhanced full duplex communication and echo cancellation. Yes, Big has a speakerphone and it’s perfect for conference calls. It’s a neat addition, because it gives the speaker diverse functions. You can also find a 3.5mm analog input, Bluetooth 2.1 plus EDR radio. Lastly, its built-in lithium ion battery can deliver 15 hours of non-stop music, and it will take 2.5 hours to fully charge. However, you can only charge it through its AC adapter. The micro-USB is only for firmware upgrade. If you love the design of the original Jambox, then you would definitely appreciate the look of this speaker – It’s basically the same but it just got bigger and bulkier. It maintains the signature boxy design of its ultra-compact brother with a rubberized side and top along with an enclosed metal grille. As for me, it still looks great and trendy, especially with its authentic Yves Behar waves and hex which was carried over from its original model. The main reason why they made this Bluetooth speaker much bigger is to accommodate for a more powerful audio hardware. The Jawbone Big Jambox has two opposing passive bass radiators which are located in its airtight enclosure. They also put in a pair of 2.25-inch neodymium drivers which were design exclusively for this model. Therefore, it can easily fill a very large space with significant amount of sounds. Even if it’s portable it can go toe to toe with a full stereo speaker system. Although I noticed that in higher volumes the sound it produced has a tendency to distort. Unlike Bose Soundlink II that can totally eliminate sound distortion. I tested the Big on various genres and it does pump out crystal clear highs and mids which I think is exceptionally impressive for a portable wireless speaker. Its bass is also crisp and tight at all levels of volume. The Big Jambox is perfect for acoustic, choral, orchestra, jazz, rock, classical pop, and vocals because it doesn’t alter the sound – so it’s more natural sounding. Overall, Jawbone did a very good job in upgrading this speaker’s audio hardware. They even updated the speaker’s software by adding ‘LiveAudio.’ This update implemented the revolutionary BACCH3D sound technology. Generally, LiveAudio filters crosstalk and gives a more 3D feel to the sound generated by the speaker. The initial cost for the Jawbone Big Jambox is under $200 on Amazon. Honestly, it’s quite expensive and comparable to the price of the Bose Soundlink II. You can also buy a travel case which they called Audio Activ Vault. It’s waterproof and would cost you for an additional $59.99. Actually, this wireless speaker is considered high-end and the price is obviously much steeper than other lesser portable wireless speaker on the market. Requires AC adapter for charging instead of micro-USB.